Are you a musician who is tired of constantly flipping through sheet music? Timing is everything when you are on stage or in the recording studio. So, why fumble through loud and distracting piles of printed music when you could go hands-free? Bluetooth page turners enable users to use their feet to swipe from one page to another. What’s more, many of these devices are engineered to trigger metronomes or backing tracks. The best part is that they can be wirelessly paired with nearly any smart device. 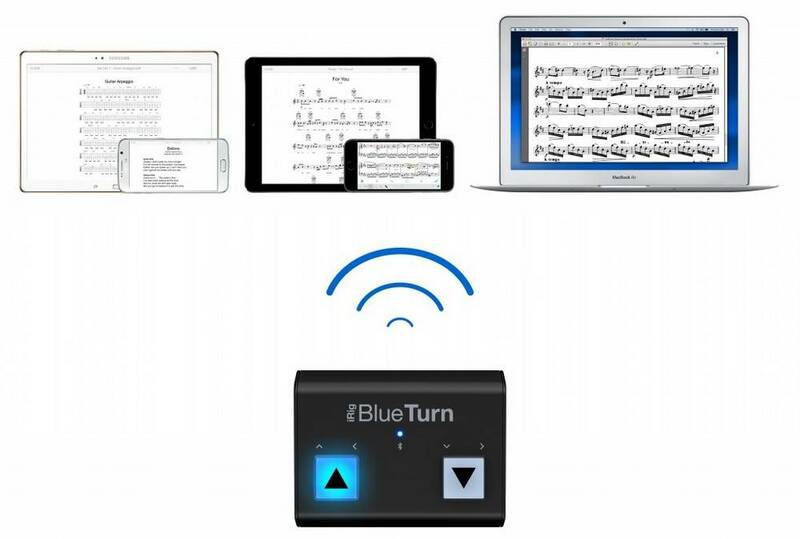 If you’re eager to regain some of your on-stage concentration, be sure to check out our top five Bluetooth page turners and take a look at our helpful buying guide. We’ve taken a hard look at some of the best-selling products in hopes of narrowing down the competition and making your consumer experience as easy as possible. 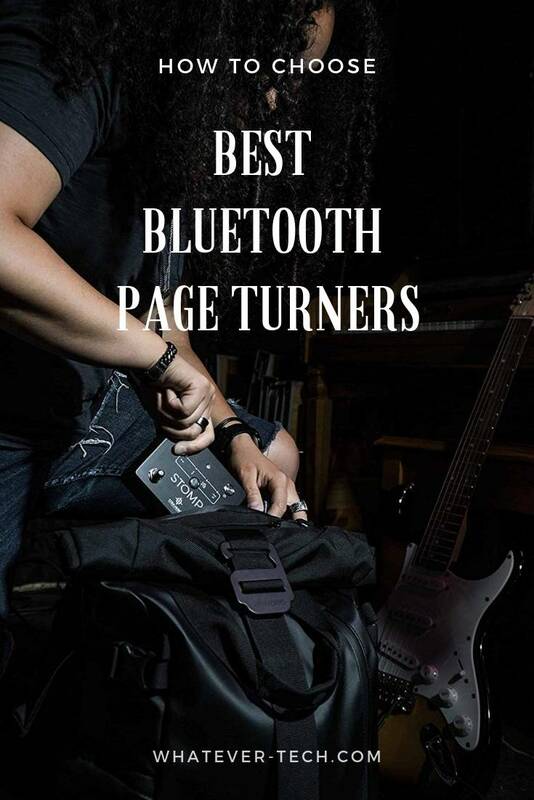 What is the Best Bluetooth Page Turner April, 2019? Buying Guide: What to Look for In a Bluetooth Page Turner? What else is a page turner capable of? Are page turners actually noiseless? Can a page turner be paired with more than smart device? PageFlip PFBUTTERFLY01 Bluetooth 3.0 200 hours / about 200,000 page turns Requires 2 AA Batteries iPads, Android tablets, Windows, Macs, and Linux Check price! 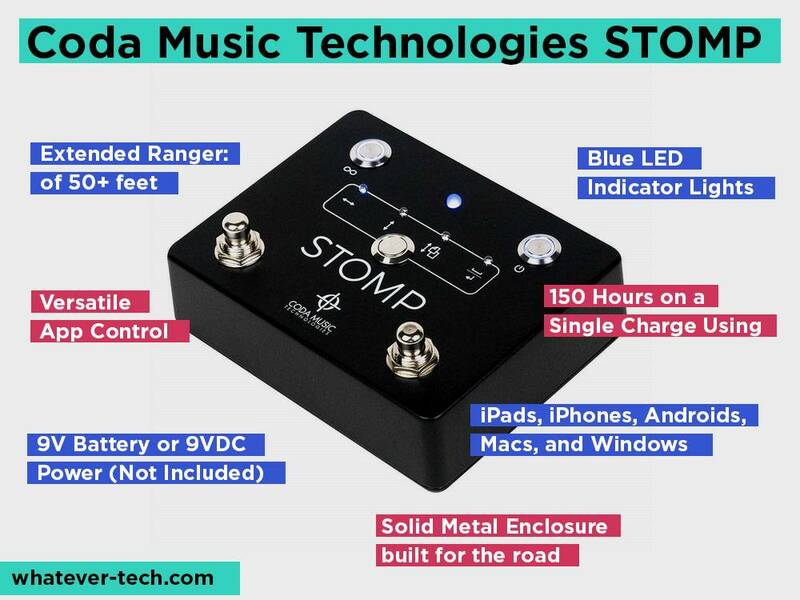 Coda Music Technologies STOMP Bluetooth 4.0 150 hours Single 9v Battery or power using 9VDC 1500mA Power Adapter iPads, iPhones, Androids, Macs, and Windows Check price! 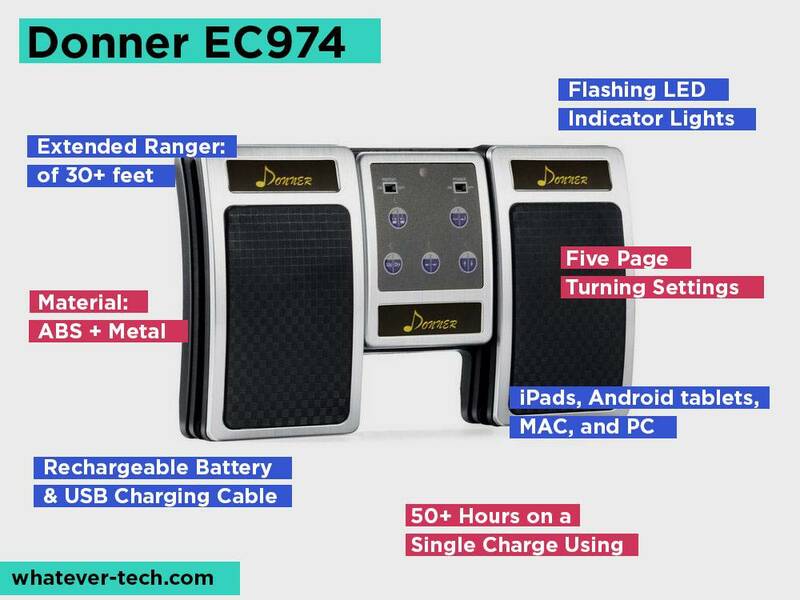 Donner EC974 Bluetooth 50+ hours Rechargeable Battery & USB Charging Cable iPads, Android tablets, MAC, and PC Check price! AirTurn QUAD Bluetooth 150 hours USB Charging Cable iPad, iPhone, Android, Mac & PC Check price! IK Multimedia IPIRIGBTURN Bluetooth 4.0 / Bluetooth LE (4.1) n/a 2 x AAA Batteries iPhones, iPads, Macs, and Androids Check price! The PageFlip PFBUTTERFLY01 is a wireless page turner with a rugged design. In fact, the Butterfly is actually a new and improved version of PageFlip’s well-loved Cicada Page Turner Pedal. 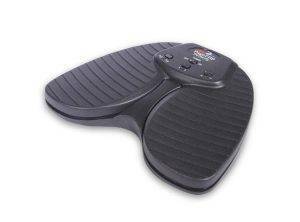 The newer version has a durable hard plastic exterior with grippy pedal tops. On top of that, it is compatible with a wide range of devices, including iPads, Android tablets, Windows, Macs, and Linux computers. In fact, the PageFlip PFBUTTERFLY01 works with hundreds of different sheet music apps. As a matter of fact, it can be paired with any program that utilizes keyboard strokes for input. Whether you are purchasing the PageFlip PFBUTTERFLY01 for yourself or a budding musician, there’s virtually no learning curve. Just pop in a pair of AA batteries and set it to a mode of your liking. While the PageFlip PFBUTTERFLY01 is commonly used by musicians, it can also be used to scan through digital books. There’s a built-in 30-minute inactivity window before the PageFlip PFBUTTERFLY01 is sleep mode sets in. What’s more, the pedals have completely silent actions. The hefty pedal of the device helps increase its stability. Meanwhile, a Bluetooth USB dongle enables users to get instant wireless support. 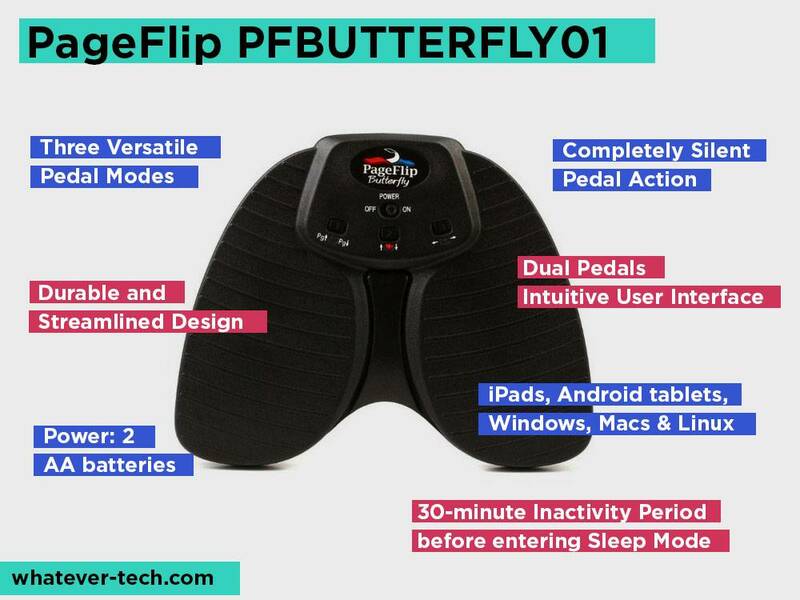 The Butterfly is PageFlip’s most economical Bluetooth page turner. Still, it offers over 200 hours, or 200,000 page turns, of continuous use. On top of that, it comes with a 1-year limited warranty. As you can see from the video, the page turner has a simple butterfly-like design that offers convenient hands-free page turning. We recommend using PageFlip page turner with ForScore, unrealBook, and OnSong with iPads and Androids. Keep in mind that these are just a few of the many apps that the Butterfly is compatible with. PageFlip is also an extremely easy company to work with. In fact, many customers have noted that the company has a super responsive customer service team. 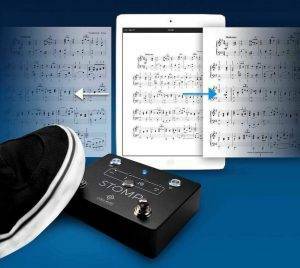 The Coda Music Technologies STOMP is engineered to enable hands-free setlist and sheet music scrolling. On top of that, the device enables hands-free metronome starts and stops, background track triggers, and PowerPoint slide changes. Its hearty design and response pedals allow musicians to focus on their performance rather than their page turning. 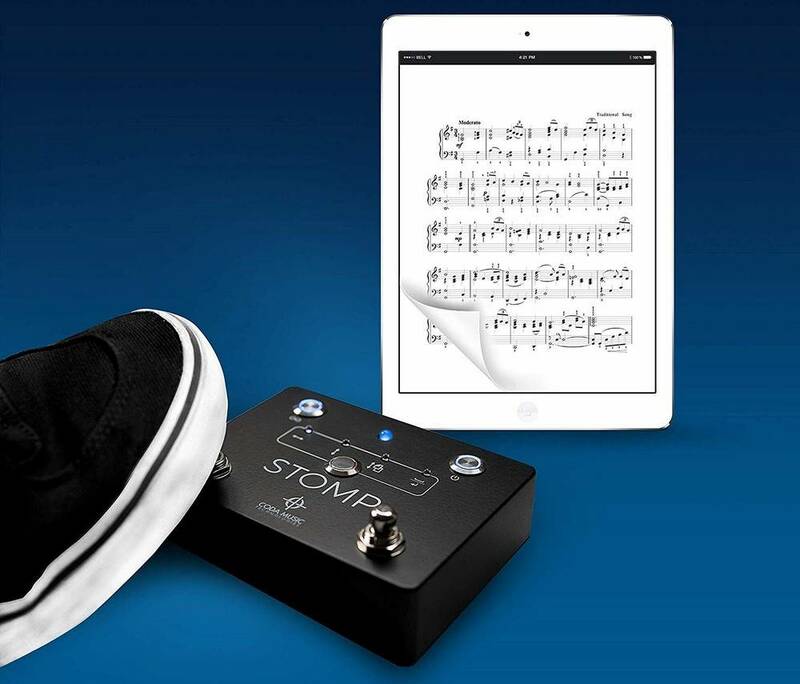 Coda Music Technologies STOMP is compatible with iPads, iPhones, Androids, Macs, and Windows devices that feature Bluetooth 4.0. In fact, the pedal works well with any app or software that utilizes keyboard stroke commands. 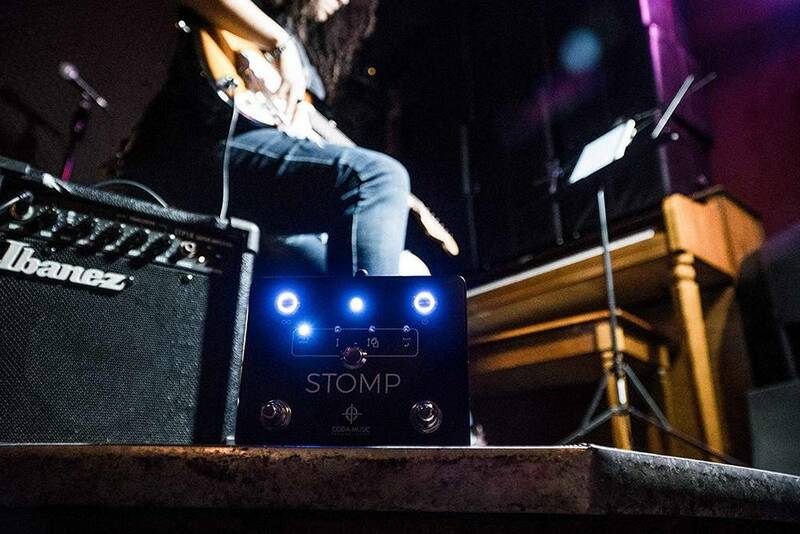 Coda Music Technologies STOMP’s durable metal enclosure makes it a favorite amongst road-faring musicians. 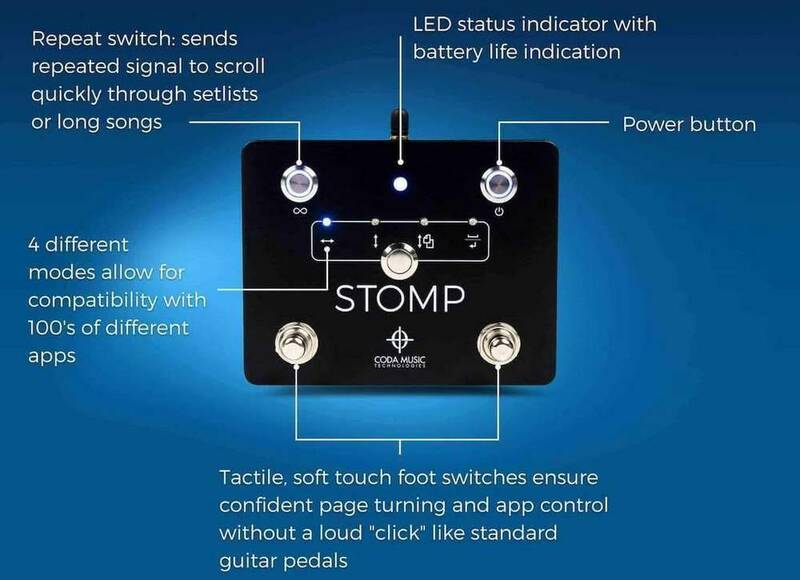 The Coda Music Technologies STOMP pedal has dual power options. Either insert a 9-volt battery or plug in the 9-volt DC power adapter. 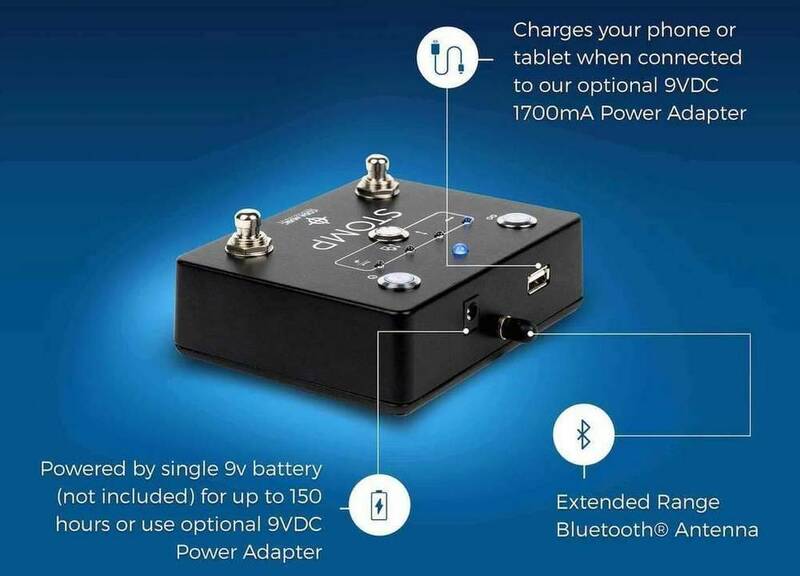 If you utilize the DC power connection, you can even use Coda Music Technologies STOMP to charge your smartphone or tablet. On top of that, the device has four preset scrolling modes. As such, it’s easy for musicians to tailor the pedal to fit their personal preferences. 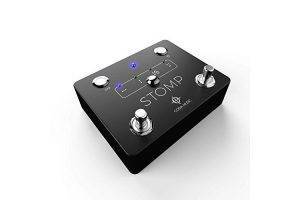 Customers love the Coda Music Technologies STOMP’s streamline design. It is all black with shiny chrome knobs and blue LED indicator lights. It even has grippy pedestal feet that help keep it firmly in place. On top of that, Coda Music Technologies STOMP is made in the USA and backed by a hassle-free money-back guarantee. We highly recommend this device for gig musicians and recording artists looking to eliminate paper stacks from their performances. If you’re a musician who’s looking to step away from paper sheet music, the Donner EC974 is a great way to start. This handy device can be paired with any Mac, PC, iPad, or Android tablet. Not to mention, it works well with most popular sheet music and reading apps, including Score, OnSong, NextPage, and DD GigBook. On top of that, it’s super easy to pair. As a matter of fact, all you have to do is enable Bluetooth on your device and press sync. The Donner EC974 pedal is made from durable ABS plastic and features rubber grip pedal tops. It also has an easy-to-read LED battery life indicator lights. 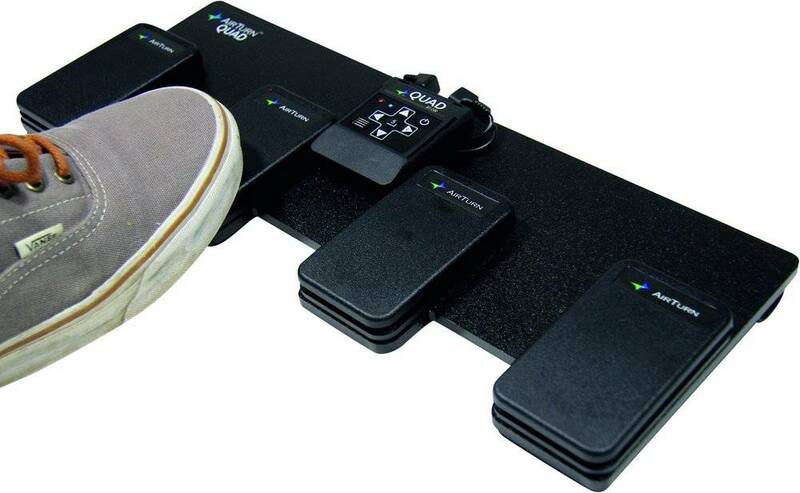 With a 30-foot wireless Bluetooth range, this pedal can be synced to an entire band. On top of that, it boasts a rechargeable battery that offers over 50 hours of page turning per charge. Consumers have their choice of three unique colorways, including silver, gold, and black. All the colors look great alongside the vintage-looking Donner EC974 label. 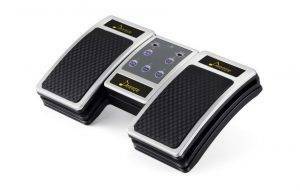 The device boasts two rectangular foot pedals that are separated by a push-button control panel. The panel offers five unique page scrolling settings that are compatible with most apps and software. The pedal is slightly arched, though its solid center of gravity gives it good footing on flat surfaces. The Donner Bluetooth page turner is a super affordable option for musicians on a tight budget. It also has a stunning vintage look that adds impressive detail to any pedal board. Not to mention, it boasts flashing LED indicator lights that let you know exactly when the device connects to Bluetooth. The Donner EC974 pedal even comes with a 30-day money-back guarantee. Not to mention, Donner EC974 has an impressive customer service team that’s always willing to help out their customers. 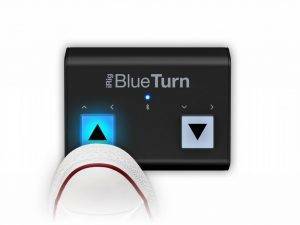 The AirTurn QUAD is a great device for musicians who are looking to eliminate background noise during their public performances and recording sessions. As the name implies, the AirTurn QUAD is a four-pedal page turner. It enables users to toggle between backing tracks, trigger pulsing metronomes, control special effects, navigate setlists, transpose keys, and much more. 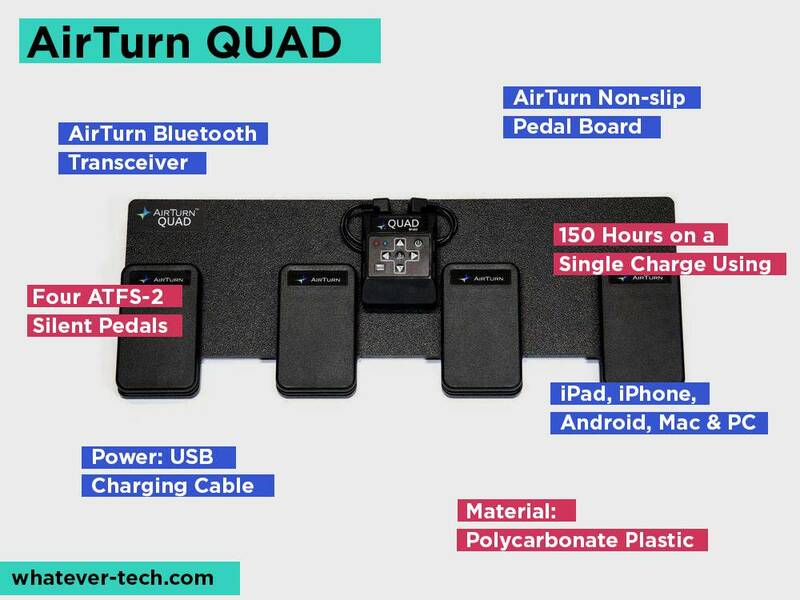 The AirTurn QUAD comes with a versatile four-pedal board with silencing backing, an AirTurn Bluetooth transceiver, and a USB charging cable. It’s worth noting that the Bluetooth transceiver can be removed and used as a remote control. On top of that, the AirTurn QUAD houses a long-lasting lithium-ion battery that offers a whopping 150 hours of page turning per charge. The AirTurn QUAD is made from extremely durable polycarbonate plastic. It also boasts AirTurn’s signature mechanism-free switchboard. As such, the QUAD enables a completely silent page turning operation. The device weighs just under 2 1/2 pounds. It measures 16 1/2 inches long, 6 1/4 inches wide, and 2 1/4 inches high. AirTurn has a wonderful customer service team that provides real-time tech support to its customers. While we found this product extremely easy to use, it was nice to know that help was always around the corner. On top of that, we loved knowing this product was made in the United States. It’s a hallmark of technological ingenuity and a game changer for any musician. While this pedal is a bit pricier than our other selections, it’s worth every penny. Yet another amazing Bluetooth page turner, IK Multimedia IPIRIGBTURN is futuristic-looking backlit page turner is super easy to use. The device is compatible with iPhones, iPads, Macs, and Androids. Not to mention, it can be used with setlist, sheet music, book reading, and slide show apps. 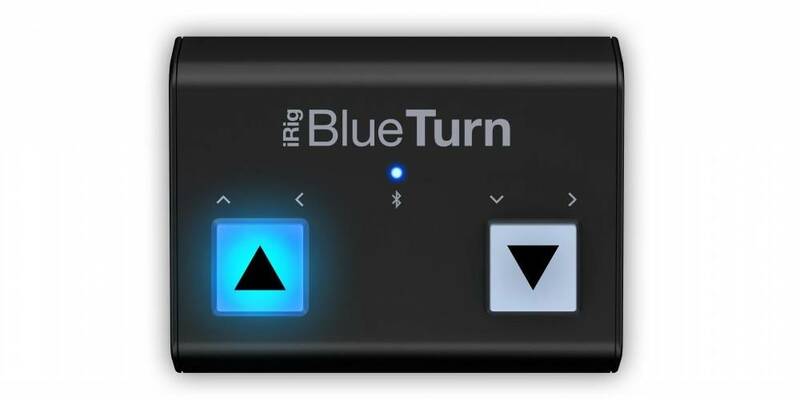 The IK Multimedia IPIRIGBTURN consists of a low-profile compact panel with two backlit pad buttons that can be used to trigger page turns, slide scrolls, and other Bluetooth-supported movements. The device features three different convenient configurations, include page up-page down, arrow up/arrow down, and arrow left/arrow right. These modes can be adjusted directly on the iRig panel. 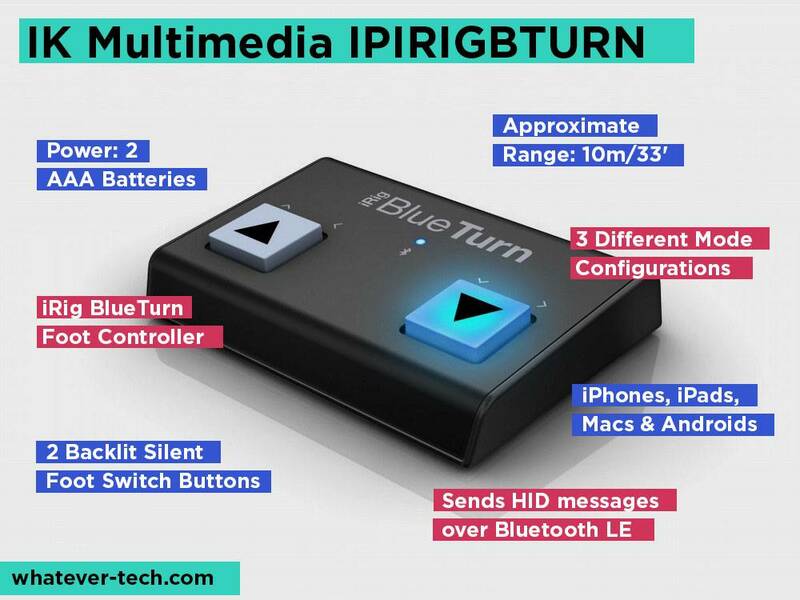 Customers have expressed appreciation for the IK Multimedia IPIRIGBTURN is completely silent performance. In fact, the dual control buttons are designed to make zero noise while remaining super responsive. On top of that, their LED lights are engineered to be seen even when background light would otherwise wash them out. The IK Multimedia IPIRIGBTURN runs on two AAA batteries. While battery-powered devices don’t always have a good reputation for longevity, the iRig page turner is extremely energy efficient. On top of that, it’s super compact, making it easy to drop into a small purse or backpack. What’s more, it keeps the Bluetooth port of its paired devices open even when it is synced. It does this by sending HID messages through Bluetooth LE. A wireless page turner can be a musician’s best friend, but it helps to know exactly what you’re looking for before you dive headfirst into the market. Bluetooth page turners typically consist of a panel of foot pedals with a few toggles or buttons. They tend to be lightweight, compact, and plain. While it’s sometimes difficult to distinguish one page turner from another, it’s important to look at all the individual elements. Page turners typically consist of two pedals, though we’ve discovered a few with more. The pedals are usually set on a small metal or plastic platform that is intended to sit on the floor. Pedals typically boast some sort of skid-free surface, such as texturized rubber grips. 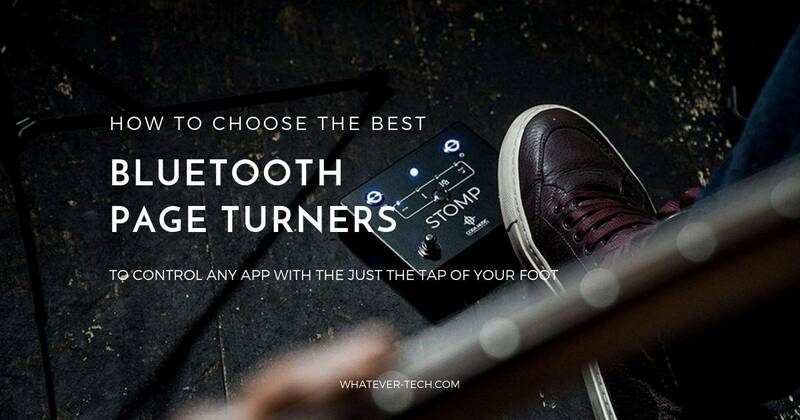 These enables a better connection between a musician’s foot and the pedal. Pedals need to be durable enough to withstand plenty of foot contact. As most musicians will tell you, onstage equipment takes a pretty hard beating, especially devices that literally sit on top of the floor. Keep in mind that most pedals are smaller than a standard foot. Compact pedals are preferred. However, they should be set far apart in order to prevent accidental peripheral contact. It’s important to select a page turner that is compatible with your smart device. The vast majority of page turners we came across were compatible with Apple and Android systems. Not to mention, they worked with a comprehensive collection of apps. Consider contacting a manufacturer for a list of apps that are compatible with their page turners. One of the most common consumer complaints we noticed was about a turners failure to sync as expected. Most new page turners will not pair with older devices. This is because new devices require Bluetooth 4.0. Bluetooth 4.0, or Bluetooth LE, are low energy. As such, they are an ideal platform for small page turners. It’s also important to note the range of distance at which a page turner can be synced. We found that most page turners could sync between 30 and 100 feet. When you consider that a standard stage is about 20 feet wide and 16 feet deep, page turners with minimal Bluetooth ranges are still capable of providing reliable connections. Beyond that, determine whether your prospective page turner can be synced to more than one Bluetooth-compatible device without issue. What’s more, determine a device’s ease of connectivity. In most cases, users just need to enable Bluetooth on their smart device and utilize one-click syncing. Most page turners offer a handful of different pedal modes. In most cases, users can set their pedal modes through an app of their liking. 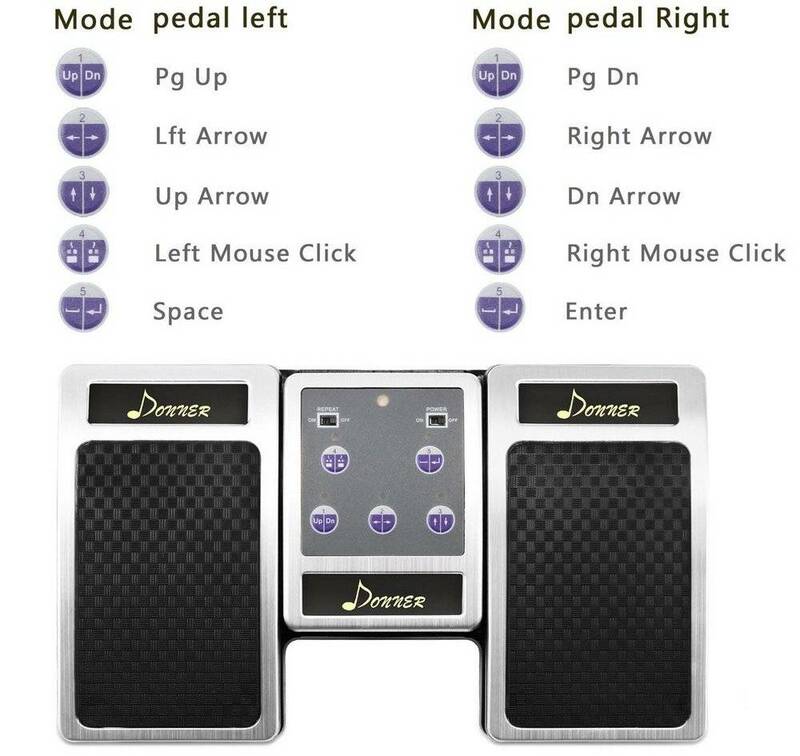 Popular pedal modes include page up/page down, page left/page right, and distinct trigger selections. 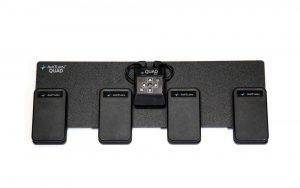 Most manufacturers aspire to create a natural and responsive foot pedal feel. What’s more, many have developed silent pedal actions. Pedals should respond instantly to subtle foot taps. Keep in mind that some page turners enable musicians to rest their foot on a depressed pedal without enabling a page turn. This stop-action response tends to confuse some musicians. Many musicians have spent endless hours curating their pedal boards and stage presence. With that said, it’s often imperative that a page turner be compact and easy to locate alongside a mess of other devices. For some, a distinct colorway or LED lights make it easier to locate a pedal in dim lighting. For others, an all-black pedal board is ideal. Consider your personal preferences before settling on a page turner. There is a wide range of power sources for Bluetooth page turners. The vast majority of page turners we came across utilized alkaline batteries. Meanwhile, some page turners had rechargeable lithium-ion batteries and others boasted DC power-in ports. Regardless of the power source, we found that most page turners utilized very small amounts of energy. As such, they could last for thousands of hours without needing a battery change or charge. With that said, we are somewhat wary of page turners that have secured battery latches. This added an unnecessary about of time and hassle to battery changes. While page turners are typically used by musicians, many can also be used to flip between digital book pages and slides. Professors, public speakers, and bibliophiles can all benefit from the hands-free control that page turners provide. Many page turners also enable the use of specialty tools and features. We’ve come across models that can do everything from start a metronome to trigger a backing track. The truth of the matter is that Bluetooth page turners are a relatively novel concept. As such, new and improved features are being added every day. Many manufacturers claim that their Bluetooth page turners are entirely noiseless, and we believe them. As you can see in the video above, there is virtually no audio output from the pedal when it is depressed. The elimination of springs and other noisy mechanisms helps reduce the amount of sound produced when a pedal is engaged. Some page turners can be paired with more than one device. Typically, you’ll need to find an app that enables shared pairing. This can help a band to stay in sync with one another. With that said, many musicians look for page turns that have controlled pairings. This helps to prevent interference between two musicians who rely on different sheet music. At this point, you’re probably fantasizing about hands-free page turning. After all, there are enough on-stage dynamics to worry about without adding papercuts and windblown sheet music into the mix. Now that you’ve finally found some Bluetooth page turners you can count on, you can finally check out those Bluetooth metronomes that have been sitting in your online shopping cart. Rock on!